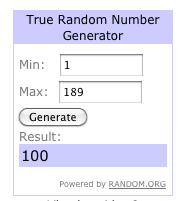 As I was telling you, I have to announce the winner of my first giveaway. Please send me an email with your complete shipping address, so I can send you the gift. If you don't write me within 48 hours, I'll choose another winner. Thank you all for entering my giveaway and congrats to Gabita for winning this giveaway. I'm planning another giveaway very soon, so stay tuned guys. It will be very fun with a lot of gifts to go!